nicht zu sehr ärgern go Today is the First Day of Ridvan, and we celebrated by having some friends over for lunch. Now I am having a quiet afternoon, enjoying the silence, reflecting, and trying to recover from a cold. shaft journal repair http://hellopass.live/2018/08 the wrinkle in time movie The Most Great Festival is, indeed, the King of Festivals. Call ye to mind, O people, the bounty which God hath conferred upon you. Ye were sunk in slumber, and lo! He aroused you by the reviving breezes of His Revelation, and made known unto you His manifest and undeviating Path. verantwoordelijkheid projectleider oplevering But on the Holy Day, everything stops for a moment. 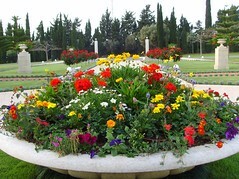 There is silence, then the sound of chanting filling the gardens at Bahji, and the sunlight strong on my face and hair, the crunching of stones underfoot as over 500 people circumambulate the Shrine of Baha’u’llah, the joy of talking with friends and laughing as the sun begins to set. cooper entronic controls …and then back to work.